Is street begging a crime? The issue about panhandling or begging in public has been debated in recent years by city councils and state legislatures. Some laws have been found unconstitutional while others remain in place. In April, 2015, for example, Arizona passed a law making “aggressive begging” a misdemeanor. Specifically, the new law prohibits asking anyone for money within fifteen feet of a bank entrance or an ATM. It also makes it illegal to ask for money on public transportation or within ten feet of a bus or light-rail stop. Touching someone without his or her consent while asking for money or blocking their way is also included in the new law. Do you think this interferes with your right to free speech? Or has panhandling become so aggressive in some instances that the public is entitled to protection? We have mentioned begging before and refer you to this post. I believe that panhandling is not a crime because that would mean that advertising is a crime because when you advertise you are trying to get something in return such as money just like panhandling. So no i do not believe that street begging is a crime. Yes it can be annoying at times but you have to do what you have to do at time am I right? Dear John: Whether you’re right or wrong depends on the specific laws where the act takes place. 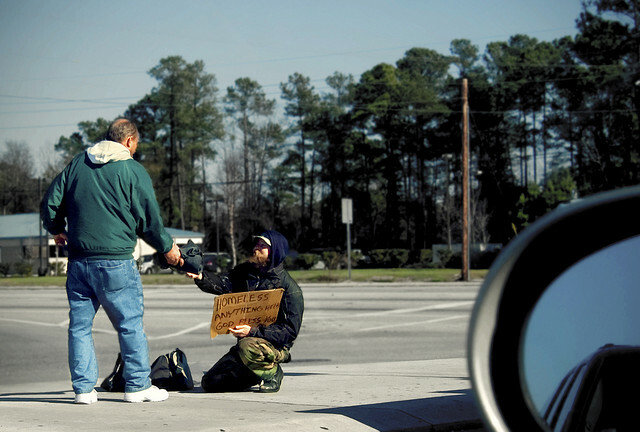 Some cities and towns have criminalized panhandling. But you have to look to the exact language of the law to see if the facts of the incident measure up to what’s prohibited behavior.